Have you ever tried to get your kids to eat more fruits and veggies without success? This is a common problem many parents have and nothing to be initially concerned with, but it’s something you should also aim to work on. Remember, children eat what they get used to, and one of the best things you can do to help them eat a more nutritious diet is to implement fruits and veggies into their normal routines as much as possible. 8. 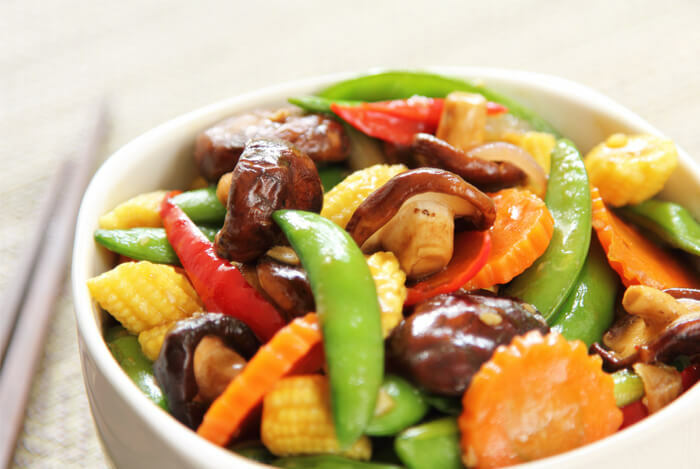 Make a Fun Stir-Fry! 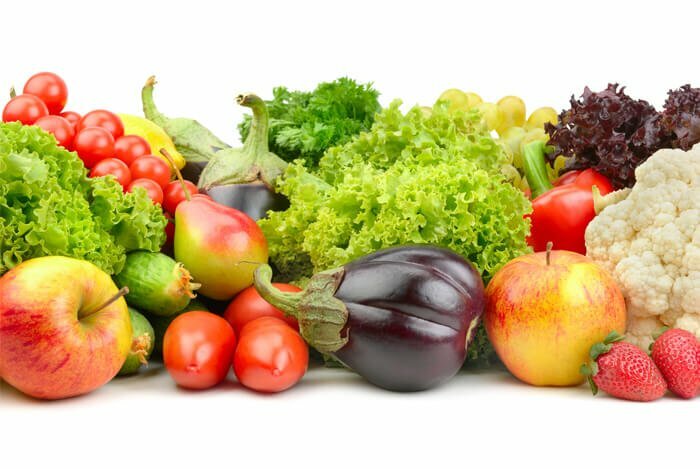 Studies have shown that children who eat more fruits and veggies not only grow up healthier, but they’re also less susceptible to obesity and Type 2 diabetes as children. But what if your child didn’t grow up eating fruits and veggies, and what if they’re exposed to unhealthy foods at school? There are still many ways you can help your kids eat more fruits and veggies so they can develop good habits now versus later. Here are some easy ideas you can implement into your children’s routine to help them eat more fruits and veggies right now. 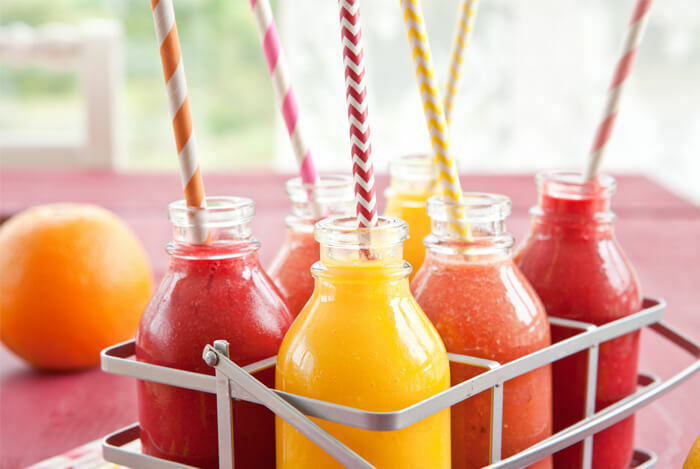 Kids love smoothies and they’ll never know if you sneak some fruits and veggies in there. To start, put 1 cup of milk into your blender. Next, add in 1 cup of spinach–don’t worry, they won’t taste it! Now add in ½ a frozen banana or ½ a fresh banana, 1 cup of frozen berries, and either a tablespoon of hemp seeds or chia seeds, 1 tablespoon of ground flax for fiber and healthy fats, and either 1 tablespoon of natural almond butter or peanut butter. Blend with a handful of ice, and serve with a smile. While you’re at it, make yourself a healthy smoothie too! Other ideas: Mix in fun fruits like pineapple, veggies like frozen broccoli which go unnoticed once combined with fruit, and even slices of zucchini or some baby carrots. 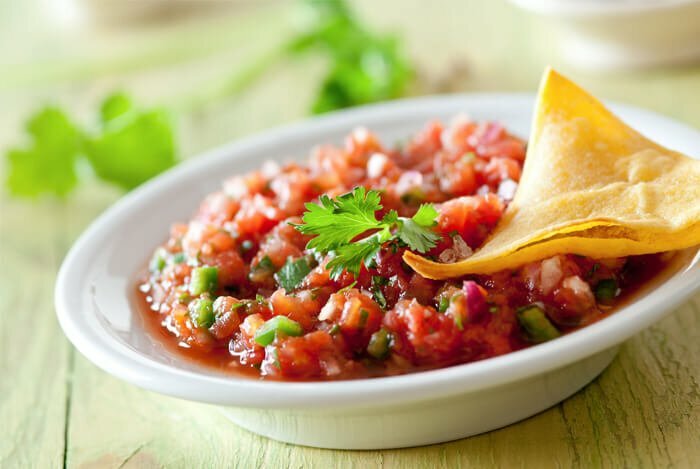 Tomato-based sauces like marinara or homemade tomato salsa are great recipes to add in puréed zucchini, carrots, and if your child tolerates them, garlic and onions. Try using red peppers or finely chopped spinach; roasted corn kernels can also be included in your sauce. Sneak cauliflower into low-fat alfredo sauce made without dairy or cream. This trick works wonderfully and you won’t even be able to tell. Other sauce ideas to make hummus made with chickpeas, tahini, lemon juice, and red peppers where you can also add in finely chopped spinach or parsley which are great sources of Vitamin C.
Or, make a homemade guacamole which is a great source of healthy fats made with avocado, tomatoes, onions, peppers, and lime juice. 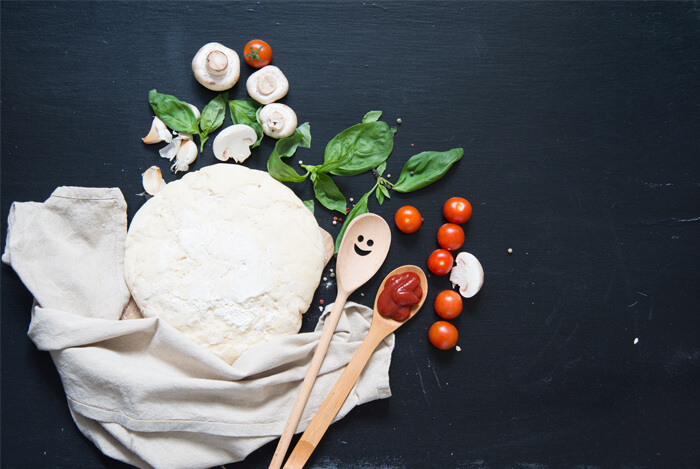 Ask your child to help you make the pizzas and show them fun ways to cut veggies into fun rounds in place of meat and get them to decorate their own. You can even mix the tomato sauce with puréed butternut squash or sweet potato purée to make it thicker, creamier, and naturally sweeter. For toppings, use nutritional yeast instead of dairy cheese; it’s full of Vitamin B12 and is a great source of complete protein that tastes just like cheese. Add sliced olives, red bell peppers, or slices of raw zucchini in place of meat, and diced carrots, mushrooms, sundried tomatoes, and chopped baby spinach if you can sneak some in. Pizzas are a fun food for kids to put together, so gather all your toppings and put them on the counter and let your kids decorate away! Fun snacks are another easy way to get kids to eat more fruits and veggies. 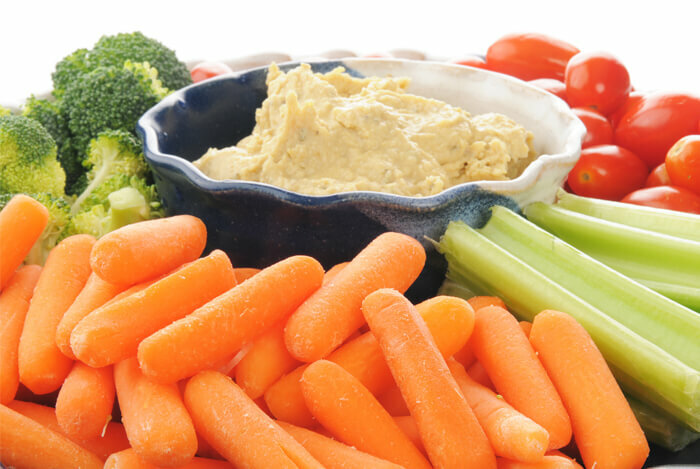 Pair some baby carrots or grape tomatoes with a homemade hummus (see above). Then show your kids how much you enjoy eating it and ask them to try it too. The more children see you eating the foods you prepare for them, the more inclined they’ll be to eat them. Other healthy snacks include natural peanut butter or natural almond butter with strawberries and baby carrots, blueberries and baby carrots, and sliced zucchini with a low-sodium salsa. . Frozen or fresh fruits are incredibly easy to add to oatmeal recipes, and oatmeal is a wonderful breakfast choice to make for your children. 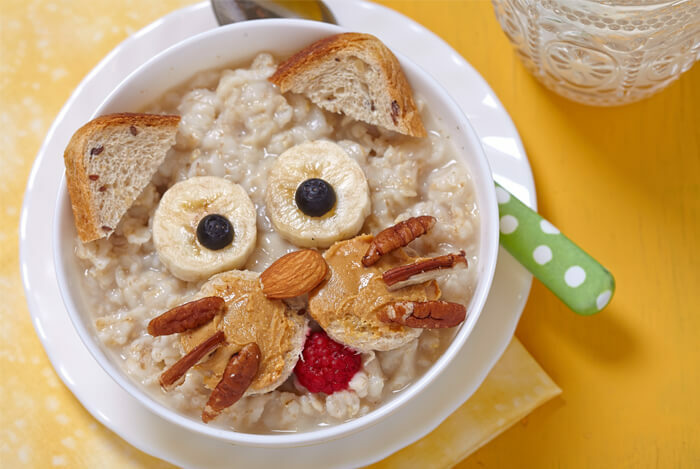 Oats are full of fiber, protein, iron, B vitamins, magnesium, and potassium which are great for kids and adults. Choose rolled or whole grain quick oats for children instead of instant varieties with added sugars and preservatives. Add in ½ cup of fruit to the oatmeal or even mix in some unsweetened applesauce and pumpkin purée. Sweeten the recipe further with a tablespoon of unsweetened raisins and a pinch of cinnamon instead of sugar. Remember, the more kids see fruits and veggies, the more they’ll eat them even if they’re slow to catch on. Put fresh fruits and veggies out at every single meal no matter what, or include frozen fruits and veggies at every meal. Save any leftovers that they won’t eat for yourself or for the next day and then try again. 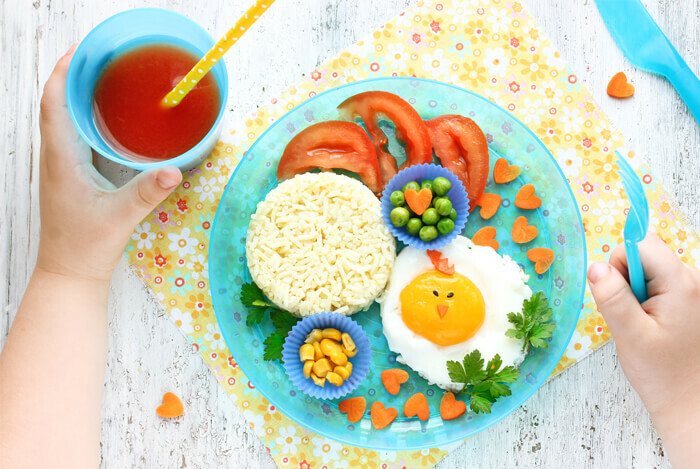 One helpful thing you can tell children who don’t want to eat fruits and veggies is to share fun things with them about the foods you’re serving. If you’re not sure about the benefits of certain foods, check out these 25 healthy foods and all the benefits they have to offer. Don’t give your children the burden of having to choose. 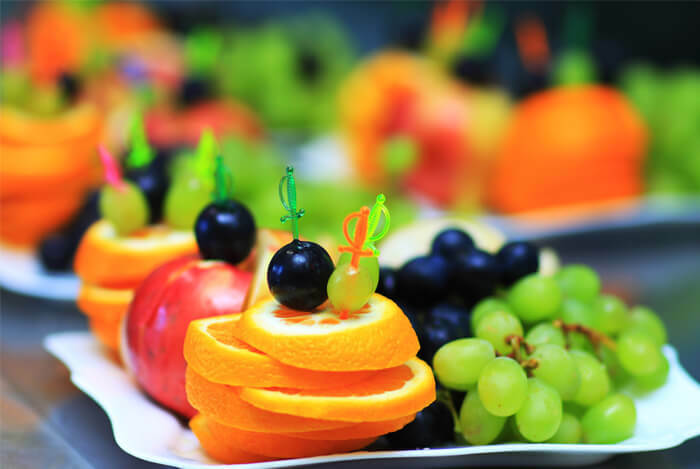 Place a platter full of colorful fruits and veggies in front of them with their main meal and make choosing a healthy option easy for them early on. Stir fry style dinners are an easy way to work in more veggies. Here’s how to make a healthy one: Instead of meat, pre-cooked red or brown lentils or black beans which make amazingly hearty and delicious stir-fries. This is a great way to sneak in more fiber, protein, and minerals into you and your children’s diets. For the veggies, choose sliced red peppers, zucchini rounds or slices, mushrooms, onions if you enjoy them, grated carrots, and any other veggies you might want. Cook the mixture in low-sodium veggie broth in place of oil on medium low heat and sauté just like you would a regular stir fry dinner. Top your meal over brown rice or wild rice for a whole grain touch and serve. Last but not least, use a classic childhood favorite meal and add more fruits and veggies to it. Cook the pasta and serve with a veggie-induced sauce. 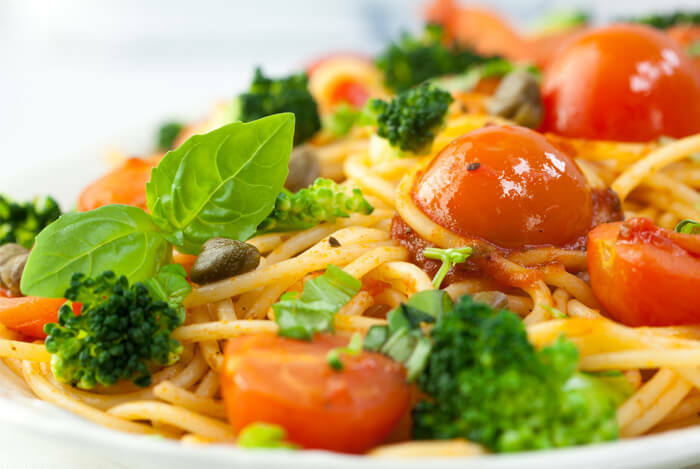 A great example is tomato sauce mixed with grated carrots, mushrooms, chopped broccoli florets, oregano, and even carrot or butternut squash purée. Tomato sauce is an easy sauce you sneak most any veggie into because of its deep flavor. If you need to add more flavor to the sauce, use a no-salt-added vegetable broth when you cook with the added veggies. Sauté the uncooked veggies in a pan with the broth and then mix in the tomato sauce just to warm. Serve over your choice of pasta options and enjoy. For dessert, choose apple slices, bananas, and berries and place them in a fun parfait glass. Then top with some healthy fats for children such as a tablespoon of natural peanut butter or a tablespoon or almond butter. No matter which of these tricks works for you, remember that the best way to get your kids to eat more fruits and veggies is to prepare foods at home. From there, do your best to eat the foods with them and share the benefits of the foods they are eating. It’s also great if you invite them into the kitchen and ask them to help you make some of their meals with them. What’s your take on getting kids to eat more fruits and vegetables? Have anything else you’d like to share? Let me know in the comments below!